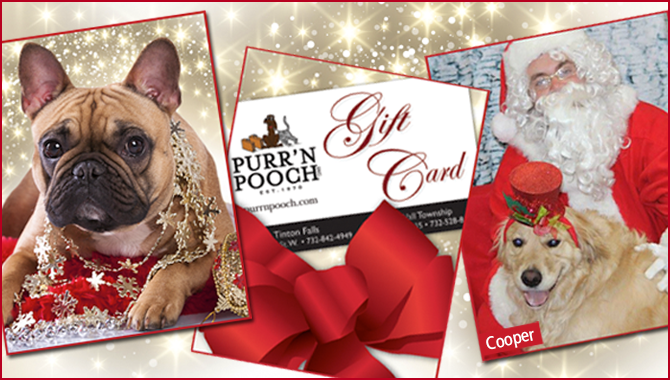 Purr'n Pooch Pet Resorts | Happy Holidays from Purr’n Pooch! Happy Holidays from Purr’n Pooch! December is a month to spend time with family and friends celebrating the holiday season. Always remember your pets are family to us at Purr’n Pooch and we value the trust you place in us when caring for them. To celebrate with your pet this holiday season we have lots of happenings. Santa will be paying a visit to both resorts. There will be sales in our retail boutiques and a Glitter & Glam spa package to get your pet in the festive spirit. To book your dog or cat’s boarding, daycare, training or spa or grooming visit, call 732.842.4949 (Tinton Falls) or 732.528.8100 (Wall). Santa will be stopping by to take pictures with all his friends in daycare. Walk ins are welcome between the hours of 11 a.m. -2 p.m. Photos will be taken by Goodwin’s Goodtime Photo Booth and available that night for pick up. Cost is $10 per photo and partial proceeds will benefit the Purr’n Pooch Foundation for Animals. Join us for games on the playground as we celebrate our daycare friends born in December. Don’t forget their ugly sweaters. Daycare dog with the “ugliest” sweater will win one free night of luxury boarding. Photos will be posted to Facebook the following day. We will continue collecting pet food and supplies until Friday December 15 to help support local rescue groups and charities this holiday season. Thank you to all our wonderful clients who have already donated. Please remember all grant applications must be postmarked before December 31. Apply now. Our Certified Pet and Dog Trainers (CPDT) specialize in household manners, everyday commands and prepare your dog to obey instructions at home, in public and around other dogs. Our training uses a reward-based curriculum that’s based on positive reinforcement. Classes run for six or seven weeks. Our honey almond shampoo moisturizes the coat while the sugar scrub gently exfoliates the tummy and elbows of your pet. The spa package also includes teeth brushing and a spritz of toasted almond cologne. Cost is $25 plus price of bath or grooming. Spoil your pet this holiday season with a relaxing massage after a day of play or when they vacation with us this holiday season. Cost is $30 for this extra pampering service. Support animals in need by purchasing wines, candles, and wreaths through the Purr’n Pooch Foundation for Animals. Learn more. Sunday, December 24 ~ Christmas Eve: Office hours 7 a.m. – 3 p.m.
Sunday, December 31 ~ New Year’s Eve: Office hours 7 a.m. – 3 p.m.
Monday, January 1 ~ Happy New Year: Office open for DEPARTURES ONLY (by appointment) 1 p.m. – 4 p.m.
March into fun and fitness!